recognize, learn, practice and keep sound priorities. Calm those psychic storms, steady your inner life and stay focused on the tasks at hand. A great program for leaders and teams. Our executive coaching and leadership programs help leaders develop the character and competence required to become Good Will Leaders™. We help organizations find, develop and retain top talent, set strategic, tactical and daily priorities, and define a unique strategic advantage. 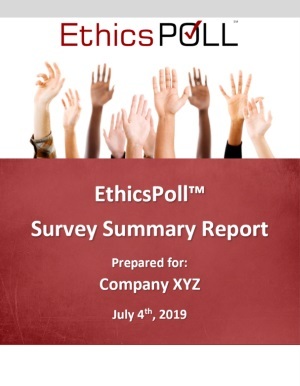 Our comprehensive EthicsPoll™ survey tools and programs help you develop and embed ethical and organizational power into every level of your organization. Priority Thinking was founded in 2003 to help leaders, employees and their teams to recognize, learn, practice, and keep sound priorities. We are based in the Greater Rochester area and work with clients around the country. Enable strong leadership, talent and team collaboration to achieve organizational objectives and results. Provide a foundation of sound priorities that naturally reduce risks to the organization and the professional. Increase the ethical power of your decision making at all levels and within all functions of your organization. Customized to your organization’s requirements and areas of interests, our web-based surveys provide you with an easy way to gather and visualize feedback data from your employees, customers, suppliers, and other stakeholders. Gather feedback live and in-person with our interactive polling technology. Allowing up to 1000 participants locally and remotely, our audience response technology gets you the data you need while making presentations fun and engaging. Our SurveyTransfer℠ tool helps organizations manage large amounts of data, acting as an interface between survey tools and secure databases. An interactive platform which allows users to view, explore and compare aggregated survey data. The Dynamic Dashboard enables demographic and firmographic data slicing, sorting, filtering and custom preferences to examine underlying trends. Looking for someone to give a boost to your event or conference? 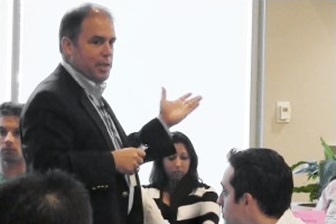 Our dynamic presentations use PriorityPoller™ technology to provide live feedback and insight, keeping audiences engaged. Sample topics include: What is Leadership? ; Getting it Right and Getting Along; Building A-Teams; the Qualities of a Leader; Crisis Leadership; and more. We are also happy to work with you to develop a fully customized presentation. “The School of Priority Thinking” is a representation of Raphael’s classic work “The School of Athens.” It features a new set of historically significant figures representing the four main approaches to work and ethics today. Author Peter DeMarco draws on lessons learned from each of these important figures as he writes his upcoming books. Click below to explore the painting and learn more about the styles of leadership that influence Priority Thinking. Each moment of each day should be spent on the most important thing for that moment. For leaders, this means carving out at least some time to reflect on their leadership role: what it is, how to lead, how to form other leaders. 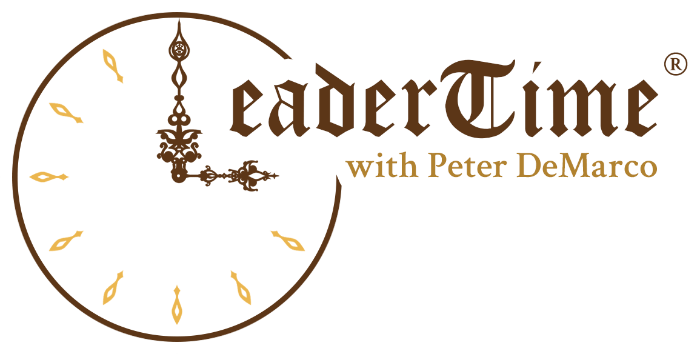 These brand new Leader Time volumes are collections of Peter DeMarco’s practical question and answer columns from the American City Business Journals that leaders-to-be can use for their reflection. 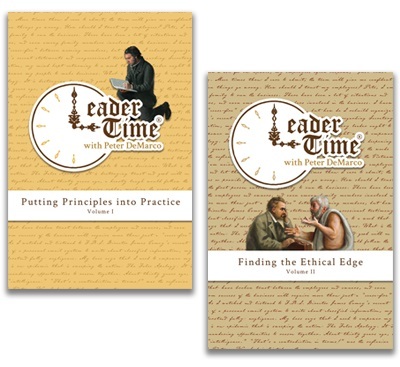 Both timely and timeless, Leader Time offers pithy applications of core leadership principles to real situations. 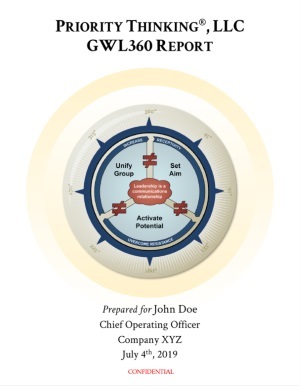 Drawing upon the multi-dimensional Good Will Leader℠ model, the GWL360 leadership assessment compares a leader’s self-evaluation with that of their associates. The analyzed data is compiled in a report designed to illuminate a leader’s areas of strength and help the leader develop areas of weakness. The EthicsPoll is a diagnostic survey designed to empower leaders to build and sustain an ethical culture within their organization. The resulting report calls attention to areas of ethical weakness and provides a development plan in order to improve.